John A. Copenhaver, President of Fletcher/Copenhaver Fine Art, is a native of Virginia and has degrees in art education from Virginia Tech and Virginia Commonwealth University. He is also an artist and studied at The Art Students League in New York City. He was an art educator in Virginia for 18 years and worked with a number of Virginia Universities supervising student teachers. He served on the board of the Virginia Art Education Association. He is currently on the board of The Antiques Council and for a number of years served as Director of Education for that organization. He is also on the board of the Virginia Chapter of the Society of Mayflower Descendants and serves as Education Chairman. Joel L. Fletcher has been an art dealer for more than 40 years. A native of Louisiana and a graduate of Tulane, he lived abroad for 16 years in Italy, France, and England, studying and collecting art while teaching and working in the field of international educational exchange for the Council on International Educational Exchange and the City University of New York. 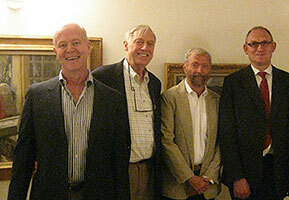 He is on the board and formerly served as Director of Communication of The Antiques Council. In 1993, Copenhaver and Fletcher formed Fletcher/Copenhaver Fine Art, specializing in American and European modern figural art of 20th and 21st centuries. They deal privately and also exhibit at a number of major antique and design shows throughout the United States, traveling to Europe at least once a year in search of interesting inventory. Fletcher curated and wrote the catalogue for the 1976 Bicentennial exhibition: America Through European Eyes: The Graphic Image, which was shown in several venues around the state of Louisiana. He and John A. Copenhaver co-curated the exhibition Moses Soyer: My Message is People in 1996 at the Museum of Arts & Sciences in Daytona Beach, Florida, and the Polk Museum in Lakeland, Florida. They also co-curated the exhibition Moses Soyer: From Social Realism to Romantic Realism at the Ridderhof-Martin Gallery of the University of Mary Washington in Fredericksburg, Virginia in 2001. 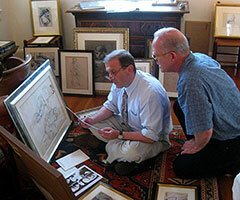 Fletcher and Copenhaver helped to organize the exhibition, curated by James Abbott: Alix Aymé: European Perception and Asian Poeticism at the Evergreen Museum & Library of Johns Hopkins University in Baltimore, Maryland. Fletcher also wrote the principal essay for the exhibition catalogue. A documentary film about her extraordinary art and life is currently being planned. 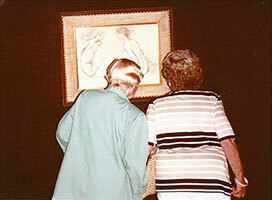 Visitors to the exhibition: Moses Soyer: My Message is People, Museum of Arts & Sciences, Daytona Beach, Florida. 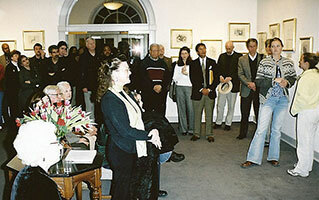 Opening night of Moses Soyer exhibition at the Ridderhof-Martin Gallery of University of Mary Washington. James Abbott, Director and Curator of the Evergreen Museum & Library, choosing works for the exhibition: Alix Aymé: European Perception and Asian Poeticism. John Copenhaver & Joel Fletcher at the Evergreen Museum & Library Alix Aymé exhibition with David Alan Brown, Curator of Italian and Spanish Paintings at the National Gallery, and Roland Celette, French Cultural Attaché. Joel Fletcher & John Copenhaver with French Ambassador François Delattre and Mme. 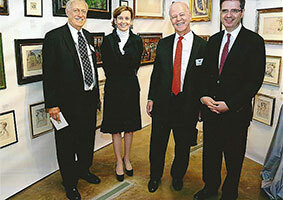 Delattre, surrounded by works by Alix Aymé, at the opening of the Washington Winter Antiques Show. 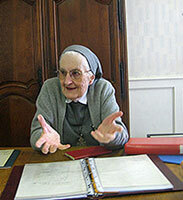 Sister Françoise de Reviers, Mother Superior of the Convent Notre-Dame-de-Fidélité, Douvres-la-Déliverande in Normandy, with the letters that Alix Aymé wrote to the sisters of the convent while working on one of her masterworks, The Stations of the Cross. The fourteen lacquer panels, designated an historic monument by the French government in 2010, are on the walls of the convent chapel. 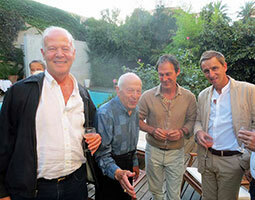 John Copenhaver with, left to right, Jacques Maso, Pascal Lacombe and Guy Ferrer at a party in Perpignan, June 2015. Jacques Maso, very lively at 91, was the dealer and close friend of Joan Miró and many other important artists. He spoke of his wartime experiences as a member of the French Résistance and later his association with some of the greatest painters and sculptors of the 20th century, including, in addition to Miró, Dali, Hartung, Mailliol and Matta. Pascal Lacombe is the authority recognized by the French government on the works of Alix Aymé. Guy Ferrer is an internationally known painter and sculptor whose monumental bronze group, T.O.L.E.R.A.N.C.E., was installed for the summer of 2015 at the gate to the ancient walled city of Carcassonne. Caroline de Courbeville of RG Les Cadres Gault in Paris who works with Fletcher/Copenhaver in selecting frames for many of their pictures. Frédéric Richard, master carver and owner of RG Les Cadres Gault working on a hand-crafted frame for Fletcher/Copenhaver Fine Art. 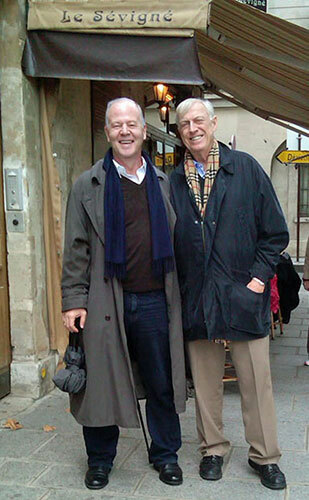 John Copenhaver and Joel Fletcher, on a recent buying trip, in front of one of their favorite places for lunch in Paris, Le Café Sevigné in the Marais.